Will certainly keep the forum posted if I am invited. I placed a deposit of €5000 in January 3rd 2017. That way I can't spend it elsewhere, good for me. I'm #19 on my local dealer's list. Keeps the spirit alive so to speak, lol! So far I've received a charging cord and a new prospectus of Porsche's e-performance. U$D 1500. Moscow, Russia. 20% after making Taycan order specification. All 4 Moscow have the same terms of delivery. December 14th 2018. 11 in line. How cool that they're already sending out the charging cord! Exciting stuff. AC12, D Wray's Garage and Tye like this. I am on the list at West Houston Porsche. 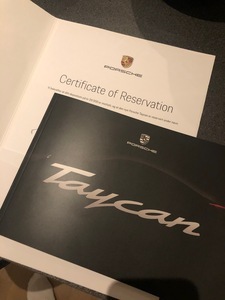 They put me on the list as I took delivery of my Panamera e-Hybrid. D Wray's Garage likes this. Deposit in early December, 2018 at Strong Porsche Salt Lake City; I'm number 98 on the list. 2015 Porsche Turbo S (mods), 2017 Porsche Macan GTS(Mods), 2012 Fisker Karma, !959 MBZ 190SL, 2017 Chevy Bolt, Taycan in 2020!! Place a $1000 deposit in San Jose back in October when we ordered my wife's Cayenne. Sales guy said there were 150+- on their list. Usually I'd call BS that any dealer already has this many deposits, but considering your dealer is in Silicon Valley, I'd actually believe this! I haven't looked up the stats but I'd imagine your area has the highest concentration of EVs in all of the US. I heard from the owner of a local speed shop in Silicon Valley that 1 in 10 new car registrations in their city is a Tesla. That seems unreal but this guy is a straight shooter. I placed 2500 deposit July 2018 in Minnesota... I have not receive the participation certificate yet.